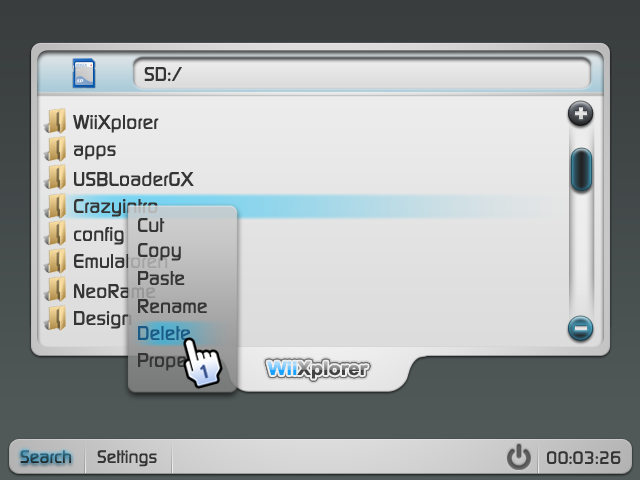 WiiXplorer is a multi-device file explorer for the Wii by Dimok using graphics by NeoRame and a customized libwiigui as base for the GUI. It has several additional features to execute various of filetypes like on an actual explorer. as it was used by homebrew browser. of the Wii (only 16bit stereo). This improves sound quality for 44.1 kHz musics. - resampled default background music of the application from 44.1 kHz to 48 kHz. everywhere the OnScreenKeyboard can be used (Text Editor / renaming / ...). - fixed bug in the player that crashed it. This file has been rated 5 out of 5 based on 7 ratings and 7 user reviews.